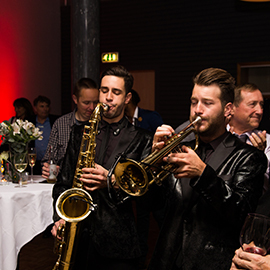 Related arranged a successful launch party for media and travel trade to celebrate Norwegian Airlines’ new direct route to Las Vegas. In October 2016, Norwegian Airlines opened their new direct route to Las Vegas from Oslo. To make Norwegian travel trade and media aware of this, Related – as Nordic PR and trade representative for Las Vegas Convention & Visitors Authority (LVCVA) – arranged a successful launch party at Ekebergrestauranten in Oslo, which has a breathtaking view of the Oslo Fjord. The classy evening event started in true Las Vegas style with limousine transport from Oslo Central Station to the venue. Upon arrival, guests were greeted with a glass of champagne, with a mingle and photo opportunity in front of a Norwegian and Las Vegas-branded photo wall, together with a Norwegian flight attendant and a Las Vegas showgirl, who flew in for the evening. After welcome speeches by the president and CEO of LVCVA and Norwegian’s director of sales, delicious finger food was served. The fun continued with Las Vegas top performer Frankie Moreno and his band entertaining the crowd, while the guests had a chance to mingle and enjoy true Vegas hospitality. Related coordinated the event – from scouting the venue, coming up with ideas on how to showcase the destination (starting with the limo pick-up and transfer to the venue to settings at the venue), and coordination between the three parties – LVCVA, the venue, and Norwegian. Thirty-five selected representatives from the Norwegian travel trade and 30 Norwegian key journalists and bloggers attended the event, which was a remarkable success and the kickoff of a great partnership with Norwegian. Reactions from the visiting trade representatives where: “The best event ever” and “I can’t wait to see the real Vegas now”. The token used in the request has expired.